Every grandmother makes a full plate like this in Belgium! A few days ago, my husband made this dinner for me! I had to relax & enjoy his latest creation! So, I did. This is what he made. This sort of dishes are eaten a lot in Belgium. We ate the white asparagus like that when we were visiting my grand parents. Normally, it would all be eaten cold, also the asparagus. They are cooked , drained, cooled off & wrapped in some lovely ham & eaten with a cold mixed salad with home-made mayonnaise. But my husband made it with baked potatoes. It was a lovely gesture & I really appreciated it! You can preboil the potatoes a few hours before dinner. 1. First make the mayonnaise. Take a medium-sized bowl & add the 1 egg yolk. With a whisk, whisk the egg yolk loose with a bit of the lemon juice & the mustard. 2. Add bit by bit, with a small spout, the sunflower oil. continue the whisk! The mayonnaise mustn’t curdle! If the mayonnaise becomes too thick, you could add a bit of the lemon juice or a bit of the vinegar. Taste . Add a bit of sea salt & some grinded white pepper if necessary. It has to taste fab! 3. An hour before dinner, you can prepare the white asparagus. Peel them with a vegetable peeler, cut off the 2 cm at the end. Cook them for about 10 to 15 minutes depending on the size of the asparagus. Drain them well & let them completely cool off. Set aside into the fridge. 4. So, now you only have to bake the potatoes. Bake them in some baking margarine on a high heat until browned on all sides. Take your plates & arrange the salad leaves beautiful on 2 plates. On top of that, add the sliced eggs. Besides that or on top of that, add the cut up tomatoes. On the front of that, place 2 asparagus tightly wrapped in ham & the baked potatoes in front of the enwrapped asparagus. After that, there are again 2 asparagus, wrapped in ham, for each one, for seconds. Yummie plate, Sophie! Horay to the husband! 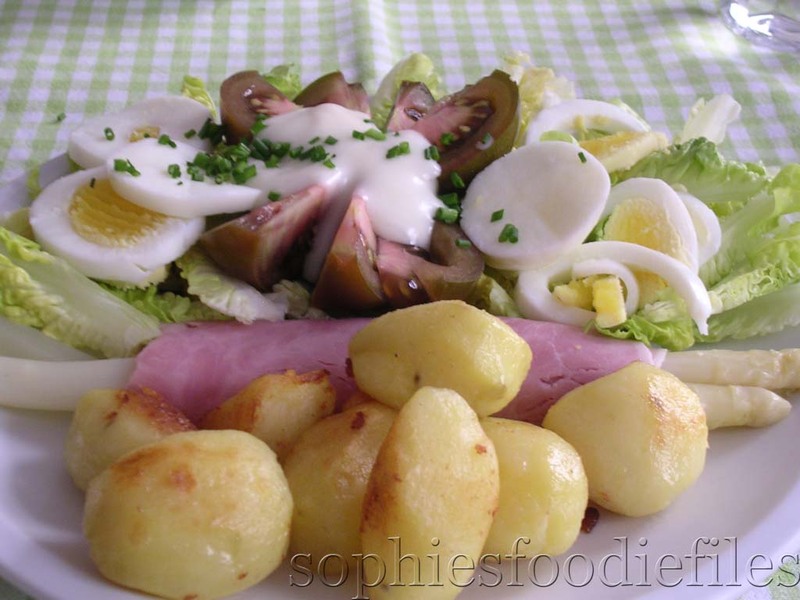 MMMMMMMMM…..This looks as a nice & easy but yummie salad! Bravo to the husband!! sympa cette assiette : bravo à ton mari ! A yummy meal with wonderful spring ingredients! Your husband did a wonderful job here! I love when you post what your husband makes. It is always so clean and fresh and simple but always looks so delicious. Don’t you love a man that cooks? Beautiful picture. Good job husband! This looks wonderful Sophie. I wish my husband would make a meal for me like this. I find it very interesting that it is normally served cold. I’ve never had white asparagus before – I’ll be on the lookout. The whole meal looks tasty. I love a good plate like that. Nick is from Pennsylvania and his family makes a plate with cut up cheese, pickles, salami, pepperoni, ring bologna, and pretzels. It is a great snack. That’s so nice of your husband to make that for you! It looks like a delicious dinner! White asparagus….yum! And homemade mayo, too! It looks so fresh! This looks great! Good work, husband! It is nice to have someone else do the cooking for you. He made a great meal! What a good husband! Sometimes it’s nice to be cooked for, even when you are a food blogger! My compliments to your husband – this is a beautiful plate! It is a perfect dish for a lovely summer al fresco dinner. Everything looks o wonderfully fresh and delicious! aww that’s so sweet! He did a great job! that looks so great! and how sweet of your husband to make you dinner! How sweet! It looks wonderful! I love how hearty and fresh this looks — it would make for a yummy picnic lunch :). That looks like a fresh and fantastic spring meal! The eggs on the salad look delicious. What a great husband!Looks delicious. I like the fact that you make your own mayonaise Sophie. This dish that you prepare for your husband look so special indeed! Bravo Mr. Sophie for making your wife a beautiful dinner! This looks great, it’s so nice that your husband cooked for you! Your hubby is so sweet to cook for you so often 🙂 Looks very yummy!! Your husband has excelled here – great looking plate of food. So nice of your husband to make this lovely dinner!! What a fun blog you have! What a lovely warm weather dish. Your husband is amazing!I’ll bet the homemade mayo takes this over the top — SO much better than purchased mayo!! I would love a dinner like that…even if I had to make it myself! My husband would have plopped a piece of meat on that plate somewhere. a labor of love 🙂 :)I haven’t tried making mayonaise… the one your husband made and drizzled it on eggs (so delicious!!! )… I must give it a try! Delightful! Looks like something from a French cottage restaurant! My husband can’t even fry and egg! I would love to come home to this one evening! What a beautiful plate of food! Bravo to your husband! Your husband is a keeper and that is one scrumptious platter. Would he make that if I flew over? Great Father’s Day gift ideas, weather radios, perfect for summer! Oh, I love cold veggies with ham. I’d even eat the potatoes cold. I like them that way with a little sour cream or yogurt. What a nice husband you have! awwww. your husband is so sweet. I think cooking is a great way to show how much you care about your loved ones. This is beautifully put together! Your husband is an artist! It looks absolutely delicious! how sweet! sean made me dinner once…and i ended up getting sick. what a handy guy you have! Asparagus wrapped in ham – now that sounds like a delicious item to put out as a party appetizer! @ every one of you: thanks for those compliments, foodie friends of Sophie! I enjoyed making this! What a beautiful plate! I’d love to try growing my own white asparagus. I love vegetarian dishes like this! I feel satisfied AND healthy too! Someone essentially lend a hand to make severely articles I would state. That is the very first time I frequented your website page and thus far? I surprised with the research you made to make this actual publish extraordinary. Wonderful process! Very good Web site – thanks!